Cognitive or mental distraction is when a driver’s mind isn’t focused on driving. Talking to another passenger or being preoccupied with personal, family, or work-related issues are some examples. Even drivers listening to their favorite podcast or radio station are at risk; the audio can take drivers’ focus away from their driving and overall surroundings. Visual distraction occurs when a driver looks at anything other than the road ahead. Drivers who check the kids’ seat belts while driving are visually distracted. Electronic devices for the car, such as GPS devices and portable DVDs/digital entertainment systems, also distract drivers. In general, driving and multitasking is a deadly combination. 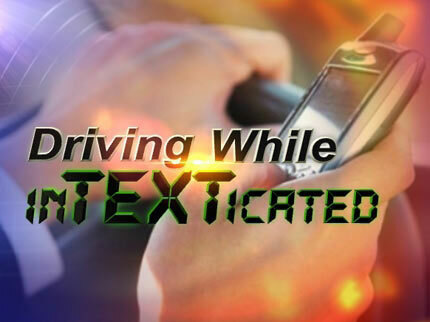 Whether you are texting, reprogramming a GPS, eating/drinking etc. your focus on driving is distracted which impacts your ability to react to constant changing conditions. A person driving at 55 m.p.h. will travel over 400 feet in 5 seconds which is longer than the length of a football field. Therefore, a distracted driver is basically driving blindfolded for 400 feet at 55 MPH. According to the National Highway Traffic Safety Administration, distracted driving was a cause of roughly 424,000 accident-related injuries and some 3,154 fatalities in 2013 alone. Turn off your cell phone — even if you’re expecting an important business call. Eat before or after you drive. Just don’t eat while driving.